"Quick, delicious mashed potatoes. I was craving 'loaded mashed potatoes' like they serve at some of the chain restaurants but was tired, busy and in a hurry so in an effort to eliminate some steps I tried seasoning my mashed potatoes with Montreal steak seasoning (my favorite slow cooker seasoning!) and threw in some cream cheese and shredded cheese for a super easy treat that the whole family raved over. Next time I will double the recipe so I can have leftovers for my lunch bucket!" Place the potatoes into a large pot and cover with salted water. Bring to a boil over high heat, then reduce heat to medium-low, cover, and simmer until tender, about 20 minutes. Drain. Mash the potatoes with a potato masher; mash in butter and cream cheese. Stir in milk, bacon bits, Colby-Jack cheese, and steak seasoning. Season to taste with salt. 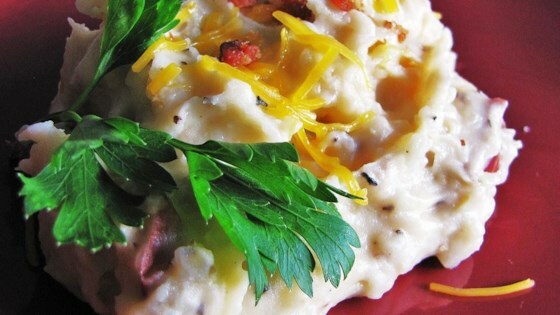 Discover the best way to make light, creamy mashed potatoes. These are good but make sure you taste as you go, it would have been much too salty otherwise. I made this with 5 lbs of potatoes. Don't double the Montreal seasoning if you are doing this or it will be too salty! Great flavor, not overly rich tasting. Love the peels left on.